Dairy cows. Photo by Coburn Dukehart of the Wisconsin Center for Investigative Journalism. This week, the Wisconsin Department of Natural Resources (DNR) gave in to the Dairy Business Association, one of the most powerful special interest groups in the state. 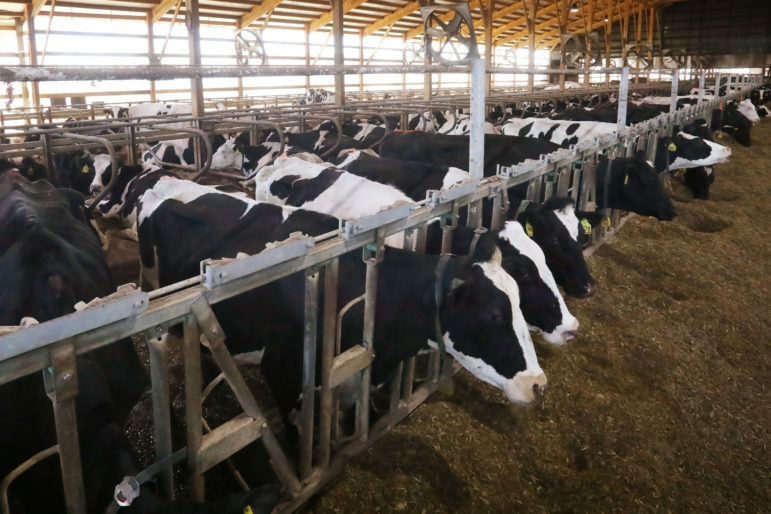 It did so by settling the lawsuit that the Dairy Business Association had brought against the DNR on terms that were highly favorable to the big dairy group, which goes to bat for factory farm owners. The Dairy Business Association alleged that the DNR was illegally banning factory farms from discharging their waste through vegetation patches. And it alleged that the DNR had engaged in illegal oversight of baby calves on dairy farms. In the settlement, the DNR agreed with the Dairy Business Association on these two charges and pledged to stop engaging in those kinds of regulation. In return, the Dairy Business Association agreed to drop another claim it was making – that the DNR exceeded its authority by requiring factory farms to apply for a permit for their discharges. The Dairy Business Association cheered its victory: “The settlement will bring immediate relief for dairy farmers facing uncertainty and costly changes, and will provide assurance that the DNR will create future rules only according to the law,” the organization said in a press release. The Dairy Business Association is backed by dozens of wealthy special interest sponsors that have contributed more than $2.1 million to statewide and legislative candidates, including more than $710,000 to Republican Gov. Scott Walker in recent years. One of the three named officers of the Wisconsin Water Alliance is Deric DuQuaine, who is also general counsel of MilkSource LLC, which operates about a half-dozen large factory farms throughout Wisconsin. MilkSource’s owners have contributed more than $130,000 since January 2011 to Walker.